Badminton is one the best Backyard Games, but there are other equally awesome games like it. Badminton, played with 2 or 4 players, is a game that you can play over and over, either fun or competitive. Everyone loves taking a few swings. The rules of badminton as a backyard game are pretty simple. It was wan’t an easy task finding games that amount to the same awesomeness as badminton. The biggest detraction of badminton, is playing in the wind. But we did find some games like badminton that are just as fun. Some of the games can be played in the wind and some games without a net. Speedminton is our new favorite racket sport and is very similar to badminton, except has a few improvements. The rackets are smaller, no nets are required, and the new patented design of the birdie allows you to play in windier conditions. Plus faster, hence the name! There are different speeders (birdies) available for faster or slower play. The speedminton rules are very simple and have players standing approximately 18 feet away defending their square. It seems like a combination of tennis, badminton, and squash. Get the price online. Jazzminton is a paddle game, without a net, that is to be played like badminton. This is a very popular beach game for adults with birdies that work well in the wind. In fact, each Jazzminton games comes with 2 sets of improved birdies that make it slower or faster depending on how you want to play. The birdie with feathers makes it slower and just using the ball make it faster. The rules are meant to be played indoors or outdoors actually, and everything is water resistant. You do not need as much space as badminton and suggests shorter distances anywhere from 5-30 feet. There is an additional ad on (not included) led night set that would take this to the next level especially while camping. Get the price online. If we had to pick the best sounding name of a game like badminton, then definitely pickleball is that. The paddles they use are smaller and a hard surface then a badminton racket, but instead of a birdie play with whiffle balls. It can be played in the water and really get some good distance when smacking them to each other. It does not need to be played with a net but works great on a tennis court. Pickleball paddles, were invented many years ago and since grown to be a large organization of players. For the games like badminton we have mentioned so far, Speedminton is my favorite but Pickleball with larger groups of people is a close second. Get the price. Paddleball is one of the oldest and best priced games like badminton. One of the classic beach games that has no net and no court. Only rules are not to let the ball hit the sand. Each paddle is about 15 inches long, with a smaller 9-inch diameter. Jazzminton mentioned above is very similar, except I prefer the birdies in that. For the price and fun for the beach you can not go wrong with paddleball. Get the price. Boom is a favorite game like badminton but for kids. It’s like any other racket or paddle game with some fun twists. The balls are squishy, water proof, and will not hurt. However, my favorite thing about this game is the large booming noise it makes whenever you hit the ball with the racket. Your kids will love playing with this outdoors in the backyard or at the beach. Designed for kids 3 and up, get the price. Tennis is a fun sport to play, but unless you live in a Belair Mansion odd are you do not have one in your backyard. But luckily tennis courts are popular at most parks or community centers in your neighbourhood. Tennis is like Badminton except you can bounce the ball, serve above your head, and scoring system. We are going to skip the rules and details, as an olympic sport, tennis is very well known. Get your own tennis net set here. If I had to choose a game like badminton that could be played indoors, Table Tennis, AKA Ping Pong, it would be! It can be a 2 or 4 player game that involves hitting ball across ad table and nets with the small paddles. Like badminton, ping pong takes a lot of hand eye coordination, agility, without as much running around. Well I say running around until you watch the Olympics and professionals that hit far behind the table and is unbelievable. For the rest of us we could be playing in our basements with a beer in hand. Get a portable table tennis set for use on any table. Racquetball and squash are similar games, and very addictive like badminton. They can be played outdoors but are mostly played indoors. They are also played with a stringed racket that gives increased speed and control. You will need this as you are essentially playing in a box bouncing the ball of walls in all direction. Many badminton players also play racquetball as it works on many of the same skills, just slightly different area and rules. It gets you running, smashing, and jumping all over the place while trying to avoid your competitor. Get a Squash Starter set. Qianball is our last game like badminton, that matches elements from squash and tennis. I think this game looks like squash without the wall so can be played well indoors or outside. A Qianball court consists of 2 rectangular areas called player and ball zone with no walls. It was developed in China and made its way in popularity to Denmark. I heard never heard about this until my trip to South East Asia, and even though is not my favorite game like badminton was sure interesting to watch. Interesting enough looks like you can play with a tennis racquet and a qianball. However I can’t find anywhere online to buy a qianball or make a qianball, so putting it in the list to see if any of our viewers have ideas, comment below! If you love Badminton, I’m sure you will find a love with one of the games above. Especially Speedminton is our newest favorite. 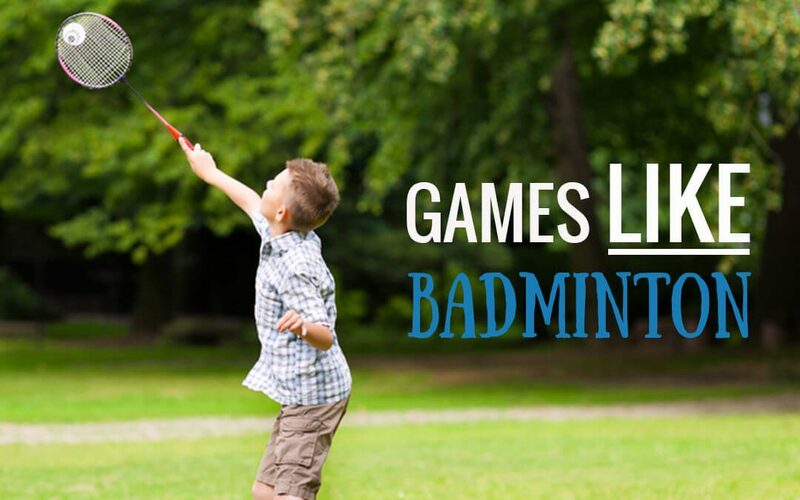 Badminton is also featured in our beach games list and games for couples lists.